A new college semester is about to begin and that means that students are preparing to head back to school for the spring semester. But some students have to juggle a bit more than just classes and schoolwork. We've found the 16 most famous kids in college this semester. These celebrities are pursuing their college degrees, juggling class and exams with the responsibilities of public life. They're musicians, actors, models and athletes who somehow find a way to balance their college careers with their professional ones—an impressive feat for such young people. They go to school all over America, from New York City's School of Visual Arts to California's University of Southern California. We've listed them here in alphabetical order. Let us know who we missed! 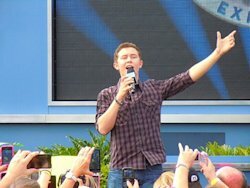 McCreery won the 10th season of American Idol in 2011— while he was in high school. Since then, he's come out with his own country album "Clear as Day" and he's won numerous awards, including the best Breakthrough Video of the Year from the CMT Music Awards for his song "The Trouble with Girls" — just hours before he donned a cap and gown for his high school graduation. McCreery is a freshman at NC State, majoring in communications/public relations. Meanwhile he is still recording new songs when he's not studying.